If you could give yourself one piece of advice when you started your career, what would it be? 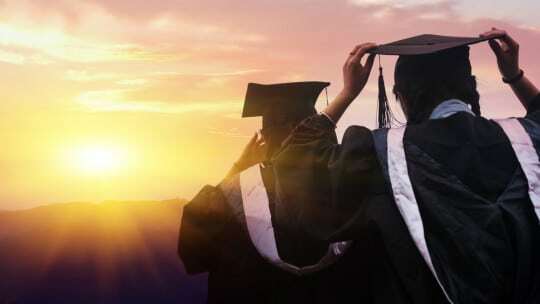 As recent PR and communications graduates embark on their first jobs out of school, we asked the PR News community to offer some career advice for our profession's rookies. Respondents emphasized the importance of writing skills, networking and reputation in their own careers. 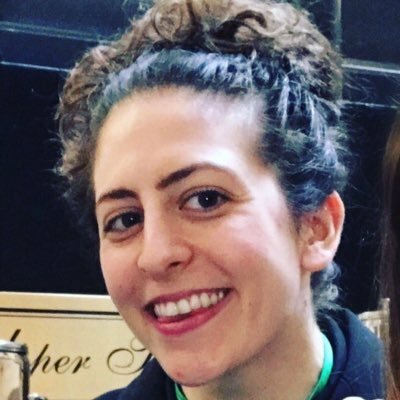 Below, a sampling of what PR News' community on Twitter had to offer their soon-to-be colleagues in communications and PR. Make being a good writer a top priority! Ask all the questions, don't be afraid to take some initiative and do the hard work. Will pay off! Your personal reputation is all you have. Protect it. Don't put anything online that you wouldn't do or say in person. Observe and learn; decide what type of practitioner you'll want to be: respected for your knowledge or feared for your duplicity. Don't be afraid to ask questions and always have a passion for your work! Do your research so you know who you are speaking to, less is more and make sure it's a 2-way conversation (don't be a know-it-all). Don't be afraid to step out of your comfort zone. I did it. It was (and sometimes still is) hell, yes. But experience is the best teacher. Get as much work experience as possible. And be prepared to start at the bottom to gain this. 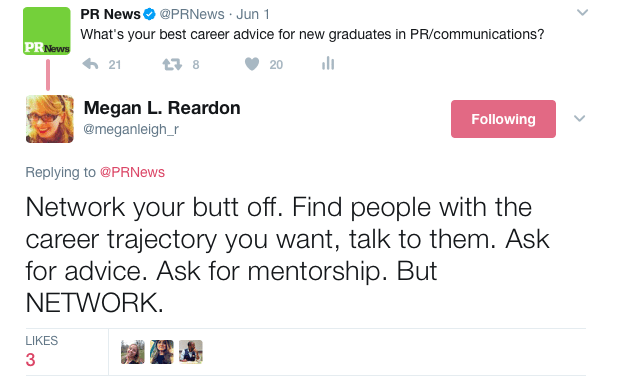 Do you have more wisdom to impart to incoming PR practitioners? 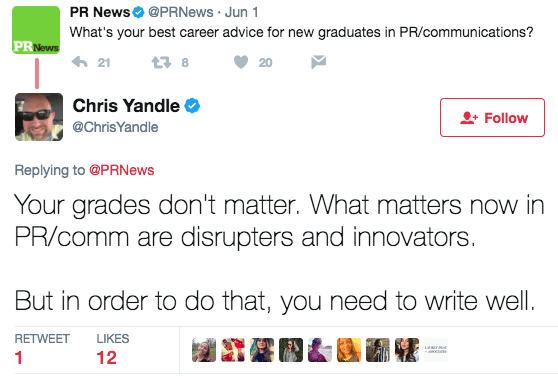 Tweet your career advice to @PRNews; we'll retweet our favorites.